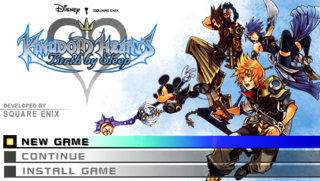 Kingdom Hearts: Birth by Sleep is another spin-off on the PSP, from the same team that remade Chain of Memories (Re:Chain of Memories) for the PlayStation 2. It was good enough to get a Final Mix version in Japan, which was later released internationally as part of 2.5 ReMIX. Regional differences for the US/PAL and Final Mix versions. Rip all the unused models from the 3D game from Final Mix, and the other unused model. Unused areas from a scrapped world for The Jungle Book are present, along with two scrapped rooms from The Sword in the Stone, and an area for a "Mysterious Wasteland". 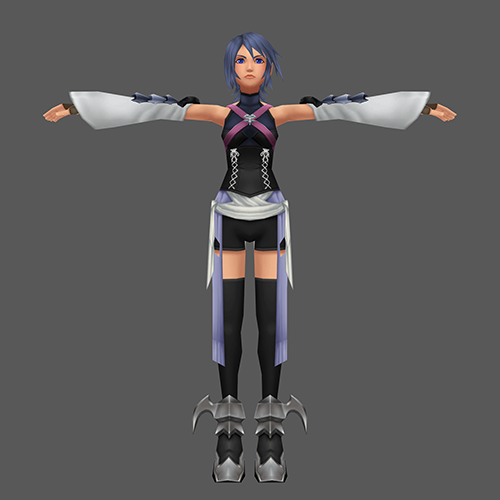 A high poly model of Aqua which is clearly more detailed than the PSP counterpart. 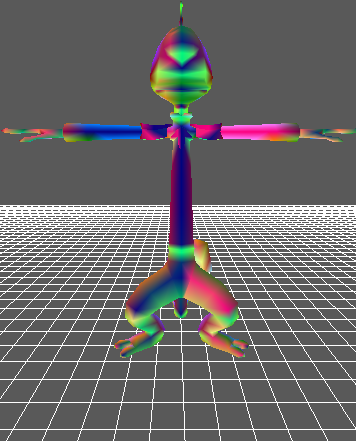 Pleakley from Lilo and Stitch has an unused model in the initial release, albeit lacking textures. There is also the logo of the demo version of the 3DS game, called simply Kingdom Hearts 3D Demo. A new D-Link was added for Pete, unlocked through the Command Board. A new boss, Vanitas Remnant, can be fought at the Badlands after completing the Final Episode. He drops the new Keyblade, "Void Gear". Another new boss, Mysterious Figure, can be fought at the Land of Departure after defeating Vanitas Remnant. He drops the new Keyblade, "No Name". Crown Stickers were added as a new collectible, and their section in the Report was added. A new Command Board, "Skull Board", was added and is unlocked after completing Neverland. More Ice Cream Beat songs were added. Critical Mode has been added as a new difficulty. Rewards for the Crown Sticker albums have been modified. Mysterious Figure has been nerfed to be easier to fight. He now also drops the new Keyblade, "No Name". All Unversed have been recolored, similarly to the Heartless in previous Final Mixes. A new Command Style, Rhythm Mixer, has been added for all characters. Some mission requirements in Mirage Arena have been made easier. Three new commands (Unison Rush, Voltage Stack, and Aerial Recovery) have been added to the Mirage Arena Shop. Illusion commands have been added, along with the Unversed Missions required to unlock them. Three new bosses have been added to the Mirage Arena: Monstro, No Heart, and Armor of the Master. Defeating No Heart unlocks the new "Royal Radiance" Keyblade. Castle Circuit has been added to Rumble Racing. A new playable secret ending has been added, "A Fragmentary Passage". It features two new cutscenes, and an entirely new playable area (the Realm of Darkness), with three new enemies (Shadow, Neoshadow, and Darkball), as well as a new boss fight (the Dark Hide). Six new songs were added, for all of the new boss fights and the exploration/battle themes of the Realm of Darkness in the Secret Episode. Environments are now more detailed, and contain new sound effects. The camera can now be controlled with the right analog stick. The Mirage Arena has had all multiplayer functionality removed, including Mirage Arena D-Links. However, most of the multiplayer based commands still remain obtainable and usable. The Lingering Will at the end of Terra's episode now sprouts a cape, to maintain continuity with its appearance Kingdom Hearts 2 Final Mix. The Taunt command has been replaced with Victory Pose, and the Group Esuna command has been completely removed. The Secret Episode cutscenes have now been dubbed in English. Three songs have been re-orchestrated, "It's a Small World", "Dismiss", and "Keyblade Graveyard Horizon".